They never do it the easy way. 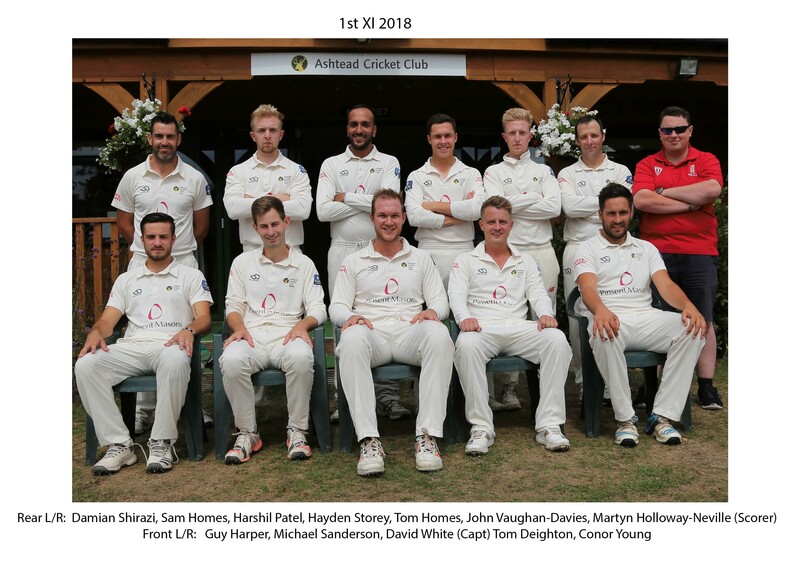 Ashtead eventually took the spoils in Round12 of the Surrey Championship Premier Division 2018, by 4 wickets, although they did make life difficult for themselves at Woodfield Lane. The Stags won the toss – that’s 8 times out of 12 so far this year – and elected to field first on another dry and hot day. The visitors started fast, and despite dropping an early wicket, made hay during the first hour. Harshil Patel, Damien Shirazi and Rafeh Jafri all failed to make much impression and by 19 overs, Sutton were 84-1. The introduction of Tom Homes into the attack saw the game begin to turn, but it would be Patel who would break the deadlock, bowling some short deliveries that fooled Luke Smith. He cleared Rafeh Jafri on the first attempt – but found his hands with the second. His departure would prove telling in the final analysis. Harry Allen, the other thorn in Ashtead’s side, was also found out by Patel before the lunch break. Sutton entered the interval at 116-3. Spin from both ends was the feature after the break, and it would be Tom Homes with a double strike just after the interval, followed by a juggled return catch for Sam to reduce the visitors to 135-6. More wickets proved harder to come by, so instead the Homes boys bowled maiden after maiden, building the pressure – and, of course, it eventually brought a wicket. 155-7. The tail wagged for Sutton, shepherded by wicketkeeper Josh Blake, but the runs refused to flow and all too soon, a couple more wickets would fall. Sutton were eventually dispatched for 197 in the 65th over. The first 6 overs of the Ashtead innings were slow going, with Ben Geddes and David White seeing themselves in. Just when the runs were starting to flow, Geddes was out for 20. The run in to tea otherwise looked straightforward, but the wickets of Conor Young, White and Sam Homes all fell in the final 3 overs before the break. At 63-4, the Stags were in trouble. It would be Guy Harper and Damien Shirazi who would lead the hosts’ charge after tea, and after an initial flurry from Harper, both batsmen slowed made their way through the overs. 50 for the partnership, then 60, then 70. Harper made his 50 off 76 balls, and at 161-5 with 10 overs to go, the Stags were finishing a glorious chase. Then Harper fell, cutting to point, for 58. In comes Hayden Storey. Tensions are high. Yet, with his usual abandon, Storey strikes 17 from an over and sees the side to within 15 runs of victory. Despite falling by the sword, in a manner consistent with his style, Shirazi and Tom Homes saw the hosts to victory – Shirazi finishing on an unbeaten 52. This win sees Ashtead rise to 6th in the league table, with safety looking much more promising than before. Next week sees Ashtead travel to Reigate Priory for the final timed fixture of 2018. Reigate Priory are currently leading the table and won the 50 over contest between the two sides earlier in the year. Let’s see if Ashtead can continue their winning ways. Join is then.